Cannabis is coming in 2019. For starters, there’s the obvious and expected boost from states that voted to legalize recreational marijuana in 2018. But perhaps more impactful than that could be the effects of the recently agreed upon Farm Bill, which would legalize hemp and the hemp-derived extract called cannabidiol, or CBD, on a federal level. 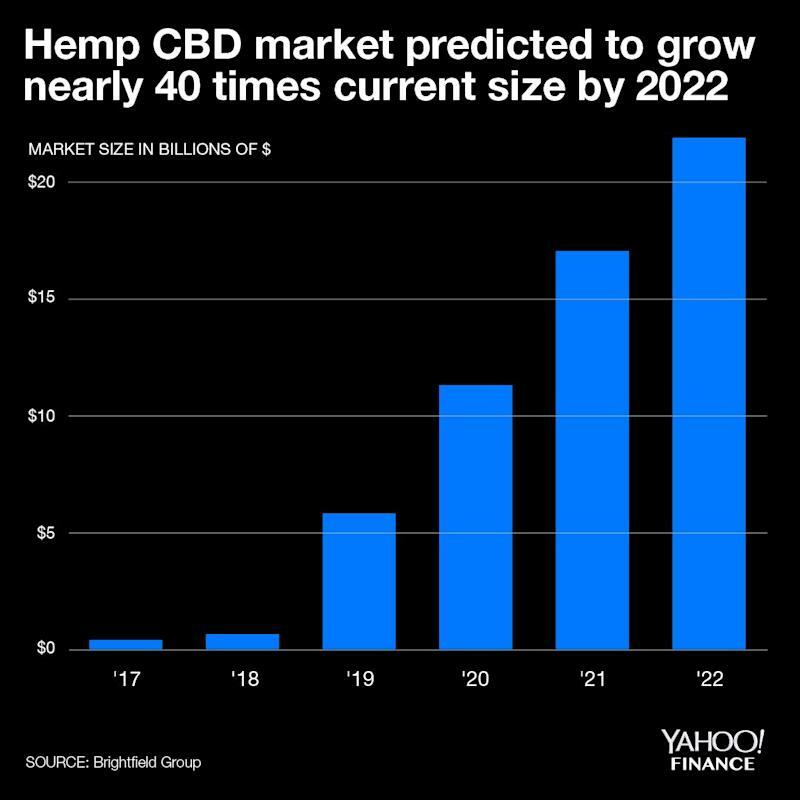 That change, which would remove the hurdle CBD companies share with marijuana companies, could trigger a CBD “exploding point,” according to cannabis research firm Brightfield Group, which foresees CBD sales growing 40 times larger than the nearly $600 million posted in 2018 by 2022. Right now, CBD and marijuana companies have to operate in a legal grey area, on a state-by-state basis. That forecast amounts to a five-year compounded annual growth rate of 132%. CBD, largely derived from marijuana’s non-intoxicating cousin hemp, has increasingly been infused in everything from creams and oils to edibles and drinks for supposed health benefits. So far, the U.S. Food & Drug Administration has been muted in policing most of the claims associated with CBD products, but that could change according to National Hemp Association Chairman Geoff Whaling. What will the FDA do? In June, the FDA approved the market’s first CBD drug, a treatment option for severe cases of epilepsy, leading some to believe the agency might be pressured to more aggressively police non-approved CBD products moving forward. For what it’s worth, the proposed Farm Bill includes language from Sen. Mitch McConnell’s Hemp Farming Act that would remove CBD from the list of Schedule I controlled substances. That change, which could happen as soon as the Farm Bill passes, would make hemp and CBD legal on a federal level, but would still leave CBD at the mercy of the FDA when it comes to being included as an ingredient in certain products including edibles and drinks. “Language in the Hemp Farming Act of 2018 actually gives oversight back to the FDA on all things from the hemp crop,” Whaling said. Some of the fastest-growing CBD categories Brightfield Group expects to see are the non-ingestible dominant areas of beauty, skincare, and topicals. Though there are a growing number of names in those spaces, Gomez said the CBD market as a whole is starting to see some consolidation at the top. 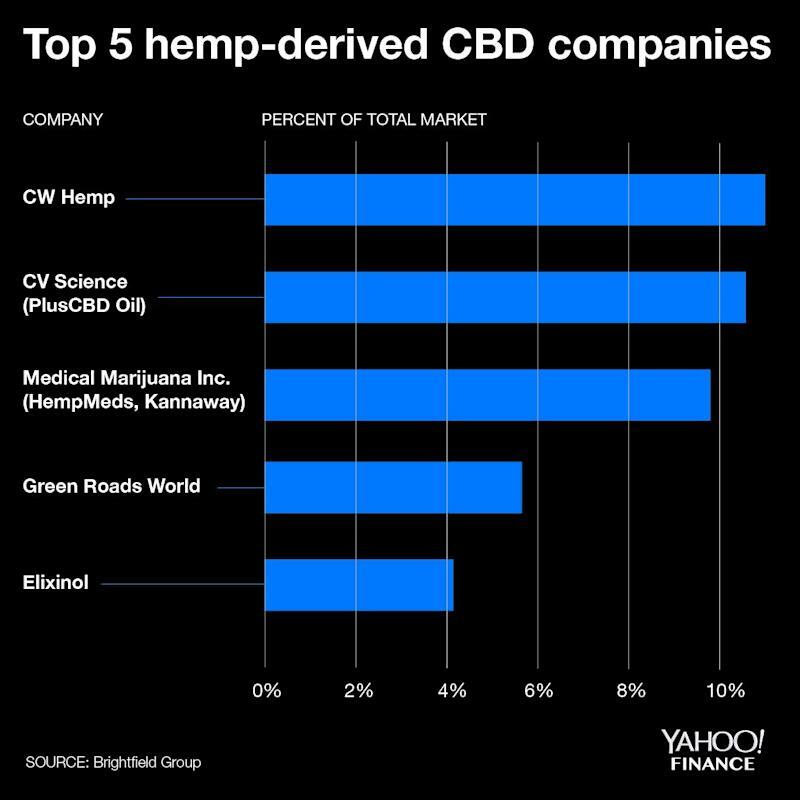 Last year, sales among the top 20 hemp CBD companies accounted for one-third of the market. In 2018, the share controlled by the top 20 companies grew to two-thirds of the market.